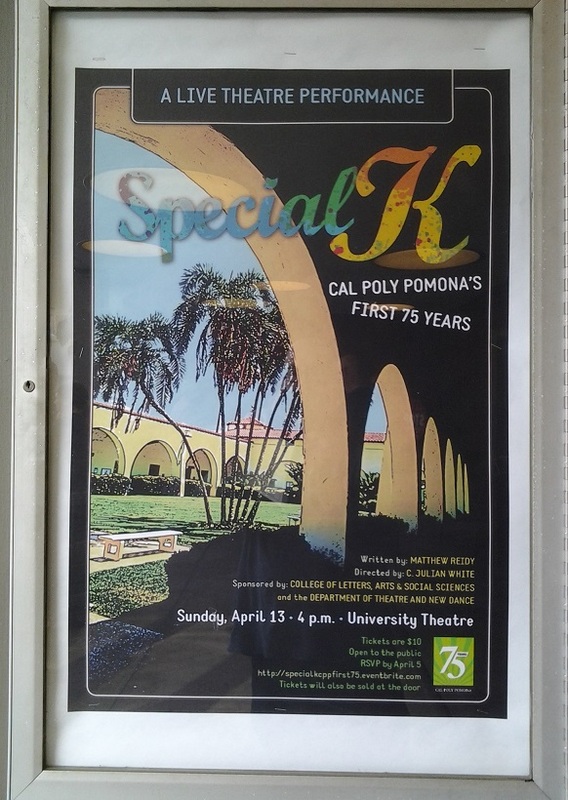 I caught “Special K: Cal Poly Pomona’s First 75 Years” on Sunday in its only planned performance. As I won’t get a chance to go into it in my column until later this week, if at all, I’ll take a moment to say how lively it was, especially when it could have been dry as a bone. The primary characters were cereal magnate Will Kellogg, humorist Will Rogers, poet and Cal Poly prof Virginia Hamilton Adair * and Mike Taylor, a student who surreptitiously built a treehouse on campus (hey, it was the ’70s). With them as narrators and regular stage presences, this was a delightfully off-kilter look at the university’s history. Good show. Any word on whether a full video of the performance will be available online (I’ve seen the “trailer”)? My dad, Henry House, was the Dean of Students who received the “treehouse” memo on the link you provided in the post. Neat! The performance was taped — I saw a camera at stage right — but I have no news (is that good news?) about how it may be shared. Hi, Bob and David. This is Dan Lee from the Office of Public Affairs at Cal Poly Pomona. As of now, the video is not available to the public. If that changes, David, I’ll let you know. Bob, if you want to send me your email address, I can let you know too. I’m at dblee (at) csupomona.edu. Dan – Thanks for the offer! Email sent to you. And David – another testament to your journalistic power!